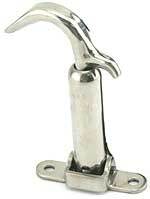 These bonnet safety supports mounts on hood rods and hooks onto the hood rod bracket on firewall. This 5" arm extends off the hood rods next to the firewall. When you raise your hood, set the bottom edge of the hood on the hooked end of the arm. Made from stainless steel with a protective plastic tube over the wire. Set includes left and right arms. New version of the popular hot rod bonnet prop for the 1928-29 Model A Ford. Mounts to the radiator brace rods with U-bolts and gives you a good solid place to rest your opened hood. Black painted steel with rubber coated ends protect the paint on your hood. New version of the popular hot rod bonnet prop for the 1930-31 Model A Ford. Mounts to the radiator brace rods with U-bolts and gives you a good solid place to rest your opened hood. 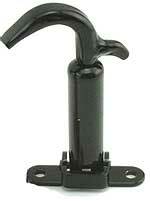 Black painted steel with rubber coated ends protect the paint on your hood. The popular bonnet prop kit that bolts onto the radiator brace rods. Fold out arms are rubber coated to rest bonnet on. Powder coated black. This prop kit will bolt on to the radiator brace rods and a rubber coated arm will fold out to rest your hood on. Made of stainless steel for long life! Bonnet Handle set for the 1928-31. The handle in the middle of the side panels for lifting the hood up. Pressed steel. set of 2. Made in USA. Bonnet Handle Rivet 1928-31. 9/64 X 3/16 semi tubular rivets for holding the A-16609 hood handles to the hood. Zinc plated steel. Sold each. Made in USA. Early 28 bonnet. This hood was used on the early 28`s only. The louvers on the side had a slight taper to them. Made in USA. 1928-29 Stock Hood. Used for all of the 1928-29 model A`s except the 4-door sedans. Made in USA. 1928-29 4-Door Sedan bonnet. 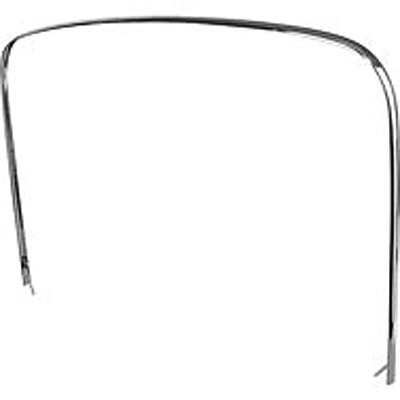 This hood was only used on the 28-9 4-door sedans. It has a bead on the side of the top panel and a different cowl contour.Made in USA. 1930-31 Stock Hood. All of the 1930-31 model A`s used this hood! Made in USA. This is a great hood. Exactly the same as a stock 1930-31 exept it has the stainless centre strip that was used on the 1932 Ford. No more chipped paint on that centre hinge. Street Rod Hood 1928-29. For the street rod, we offer this hood. Everything about it is stock except the side panels have three rows of short louvers. Made in USA. Street Rod Hood 1930-31. For the street rod, we offer this hood. Everything about it is stock except the side panels have three rows of short louvers. Made in USA. Street Rod Hood 1928-29. Three row louvered side panels with the stainless steel 1932' style centre hinge. This hinge helps to avoid paint chipping. 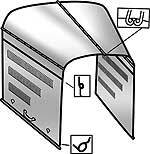 Order special 32' style hood retainers for this style hood. Made in USA. Street Rod Hood 1930-31. Three row louvered side panels with the stainless steel 1932' style centre hinge. This hinge helps to avoid paint chipping. Order special 32' style hood retainers for this style hood. Made in USA. Stainless Hood rod set for the 1928-29 Model A Ford. Each set consists of all 3 of the hood rods. Stainless tubing, not solid. Made in USA. Stainless Hood rod set for the 1930-31 Model A Ford. Each set consists of all 3 of the hood rods. Stainless tubing, not solid. Made in USA. Hood Corners for the 1928-31 Model A Ford. To be authentic, use this type triangle leather hood corners on the rear only. Comes with authentic style rivets. Set of 2. Made in USA. Rubber Hood Corner set for the 1928-31 Model A Ford. Moulded rubber A very nice looking Hood corner. Set of two. USA made hood shelf set for the 1928-29 Model A Ford. This is the metal strip that runs the length of the hood to front edge of the fender. The hood latches rest on top of these. All new tooling, American Made! Sold as a pair. Hood Shelf set for the 1928-29 Model A Ford. The metal strip that runs the length of the hood to front edge of the fender. The hood latches rest on top of these. These are the non USA made versions. Great price, but the front holes may need to be moved forward 1/4" Original holes are 5 3/4" apart. Hood Shelf Block set 1928-29. They go under the hood shelf and are used as spacers in mounting the hood latches. Hood latch screws included. Made in USA. Centre Hood Bracket set 1930-31. Mounts on the frame with the rubber bumper pressing against the hood to prevent rattles. Powder coated black with bumper correctly riveted in place. Made in USA. 28-29 Hood Retainer. The back retainer for the hood. Made in USA. 1930-31 Hood Retainer. The back retainer for the hood on the standard car. Made in USA. Hood Hinge Retainer 1930-31. 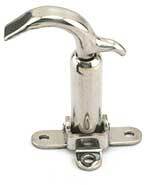 A chrome finish retainer that clamps over cowl moulding strip. Usually fitted on the deluxe cars. A stainless finish retainer that clamps over cowl moulding strip. Usually fitted on the deluxe cars. Hood retainer Mounting Screws 1928-29. The set of screws to mount the rear hood retainer to the firewall. These are the screws to mount the rear hood retainer to the firewall. Made in USA. Hood retainer Mounting Screws 1930-31. A set of screws to mount the rear hood retainer to the firewall. Made in USA. A set of screws to mount the rear hood retainer to the firewall. Made in USA. 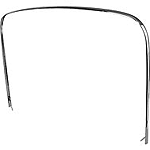 Hood Shims 1928-29 .015" Thick. If the bottom of your hood is tipped forward and hitting on the radiator shell, these shims will correct the problem. Slip these steel shims between the rear hood retainer and cowl. Made in USA. Hood Shims 1930-31 .015" Thick. If the bottom of your hood is tipped forward and hitting on the radiator shell, these shims will correct the problem. Slip these steel shims between the rear hood retainer and cowl. Made in USA. When using a bonnet with the 1932 style centre hinge strip on your 1928-29 model A, you will need this special retainer for the rear hood retainer on the cowl. Made in USA. When using a bonnet with a 1932 style centre hinge strip on your 1930-31 model A, you will need this special retainer for the rear hood retainer on the cowl. Made in USA. This Model A Retainer Cage Nut Kit, mounts to the underneath of the firewall where the rear hood retainer mounts. 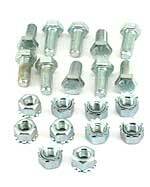 Use this kit to replace damaged rear hood retainer cage nuts. This kit comes with two nuts, cage, rivets, and mounting instructions. 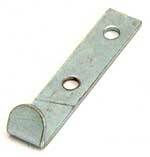 This can either be riveted in place or spot welded in place. Fits 1930-31 Model A Ford only. 1930-31 Model A Ford Cowl Band. A very good reproduction of the original stainless steel cowl band used on the 1930-31 Model A Ford. (Not for the 1928-29 four door Sedan). Cowl Band Clips for the 1930-31 Model A Ford. Most cars are missing these little clips. They slip under the screw that holds the top of the cowl panel to the firewall and slip under the cowl band to hold it in position. Made in USA. set of 2. 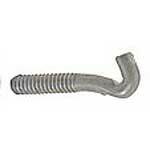 As used on the 1928-29 Model A Ford, this bracket is what the A-16739-AC cowl lacing hook draws against. Cowl Lacing Hook for the 1928-29 Model A. This is the special hook that holds the top lacing on. The hook that the wire attaches to. Made in USA. Radiator Shell Lacing for the 1930-31 Model A. The special double beaded lacing for the radiator shell. Comes with raven finished rivets. This 1930-31 kit contains 6' of 3/4" wide lacing 1/8" thick. Made in USA. This replacement style comes with regular double bead lacing and rivets. contains 36" of 5/8" wide lace and 42" of 1/2". Made in USA. This original style uses a stainless wire to hold the lacing down over the gas tank, and the pieces on the cowl panels were riveted on with raven rivets. Cowl Lacing Kit for the 1930-31 Model A Ford. 85" long. This kit is just like Henry used. Complete with clips, screws and rivets. Made in USA. Cowl Lacing Screws 1930-31. Set of three special pan headed bolts used when installing the 30-31 cowl lacing. It comes with the cowl lacing kit. Retainer clip for the 1930-31 Model A Ford cowl lacing. You will two of these, but they are included in the cowl lacing kit. The Fuel tank to Firewall screw set for the 1930-31. The Fuel tank to Firewall screw set for the 1928-29. The Cowl to fuel tank screw set for the 30-31. 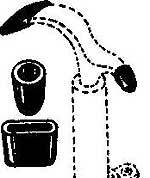 5/16" fine threaded bolts and nuts used to hold the back edge of the gas to the body. NOTE: Some cars used a 1/4" coarse thread bolt. We do not carry these. Hood Lacing Rivets. Any Year. A pack of 24 raven finished split rivets used to attach the hood lacings. Made in USA. 1928-29 Hood Latch Black. Black 3 hole mounting style as used originally in 1928-29. 1928-29 Hood Latch in Stainless. 3 hole mounting style as used originally in 1928-29. 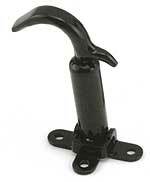 1930-31 Hood Latch in Black. 2 hole mounting as used in 1930-31. 1930-31 Hood Latch in Stainless. 2 hole mounting as used in 1930-31. Hood Latch Screws for the 1928-29. Round Head Screws, nuts and washers needed to mount all 4 hood latches. Hood Latch Rivet Kit 1928-31. These are the tiny rivets that hold the body of the hood latch to its mounting bracket. 4 per set. Made in USA. Hood Latch Caps 1928-31. Rubber caps that protect the paint from getting scratched. Made in USA. Note: 1 set does all 4 hood handles. Hood Latch Pads 1928-31. A set of 4 rubber pads for under the hood latches. Use as is on the 28-29's, and trim off the lip for 30-1. Made in USA. 1928-31 Bonnet Latch Bracket set. The bracket that is fastened on the hood that the latches hook onto. Set of 4. Individual bracket from the A-16750-CL set. 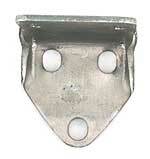 1928-31 Bonnet Latch Bracket Rivet. 9/64" x 1/4" long semi-tubular rivet that hold the hood clip brackets to the hood side panels. Zinc plated steel. Made in USA. 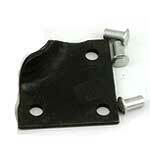 1928-31 Bonnet Latch bumper set. Fits over the stem of the hood latch. Rubber jams against the hood for a rattle free clamp. These are an accessory, you can't use these if you already have A-16761 or A-16761-B on your hood. Made in USA. 1928-30 Bonnet Bumper Set. A set of correctly shaped round rubber bumpers, that attach to the hood. One goes under each hood clip, and one on each side in the middle on the support clip. Kit comes with correct black japaned tubular rivets for attaching. Made in USA. 1931 Bonnet Bumper Set. The 1931 Model A used this hood bumper set. The 2 round ones went on the inside centre support, and the 4 triangle pieces went under each of the hood clips. Made in USA. Hood rear mounting Bracket 1928-31. This bracket is riveted on to the frame that the rear hood clip is bolted to. Made in USA.